there are a number of reasons to like linux. i have several stupid reasons i like linux. mostly it was the price. it is hard to beat the price of free software. but as i get deeper into linux, i think there is more to linux than just it's price. some of it is freedom, but mostly it's being able to build something your way from building blocks that are tried and true. i am mostly a hardware/networky guy, so i like the idea of being able to buy HW and putting free SW on it. i like knowing that i can build networks of servers and workstations that run HW effectively and efficiently, and use a standard set of networking tools and protocols. i think that it is great that i can outfit an entire network, top to bottom, servers and workstations, routers and firewalls, with one CD and an internet connection. that is why i like linux, and that is why i don't mind all the tinkering and tweaking and everything that you have to do to make it work. i have been using corel linux at home on my amd k62400. i like it because it is really easy to install. i liken it to installing win95, all the work is done for you, and it's fast. the big news is not that i am using it, but that my wife is too. she does transcription (typing the stuff that is said during tv shows, trials, and stuff) and she uses word perfect. i detest paying money for software, but we had to bite the bullet and buy a copy of wordperfect, i was pleased to discover that corel linux deluxe (the version that includes word perfect) was cheaper than word perfect office for winblows. so we decided to buy it since all we needed was wordperfect. it installed painlessly and she has been working away ever since. there is a problem with using really old document formats (like version 5) it causes WP to exit with no notice. so you have to do the star office thing (save your document every 30 seconds :-) but working in native (WP 8) formats is no problem. at work i use both NT4, 2000 professional, and linux. i installed redhat 6.2 via FTP the other day (i am now 3l33t :-). talk about cool. you can read about it here. 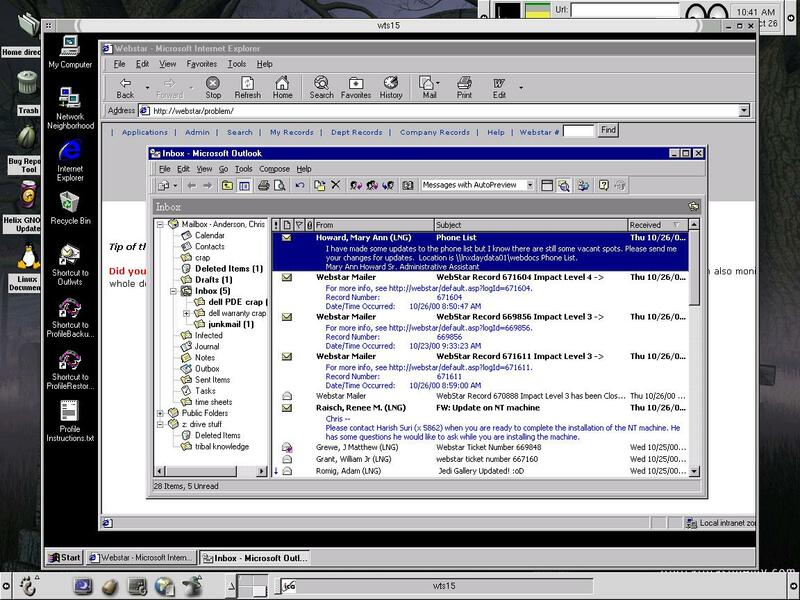 the screenshot is from mandrake 7.0. i installed the citrix winframe client to access our windows NT terminal servers (TSE). 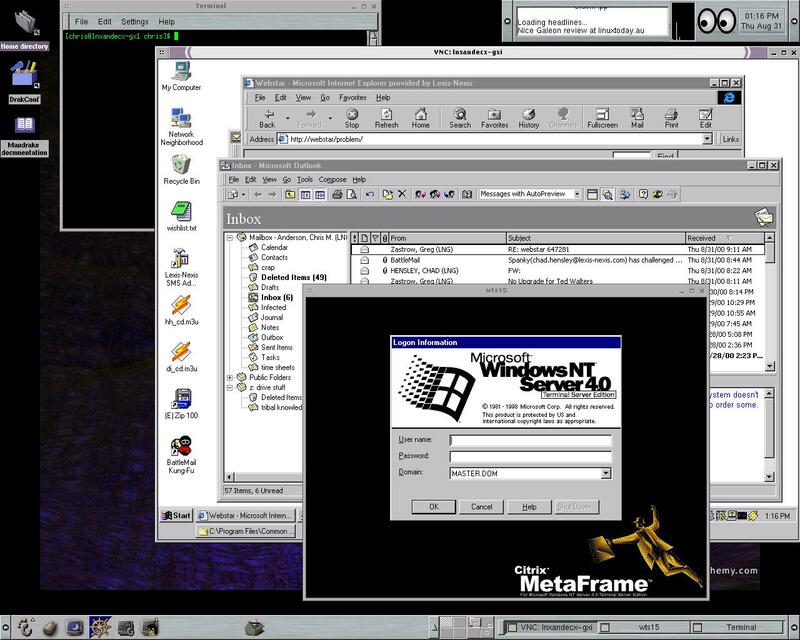 i also use VNC to access my NT box. the helpdesk trouble ticket system we use is webbased and only works with IE4, for which there is no linux variant. it also requires a 1024x768 minimum reslolution otherwise it looks like crap. our citrix sessions run at 640x480 by default (is there a client side setting to change that? yes there is, check out the shot from my rh6.2 box and the funny NT story that goes with it) so if i run IE from the NTTS, it still looks like crap. so i use VNC to remote my NT box. the other cool thing i am playing with is helix gnome. it's really cool too. i am still on the lookout for cheap (sub $400), small footprint PCs to turn into an LTSP clients, and a router. if you know where i can find one let me know.